Your company’s ability to engage job seekers in the recruitment process will significantly influence its success in the war for talent. Failure to understand and address differences in perceptions and preferences among today’s job seekers will results in fewer qualified candidates in your pipeline, lower offer-to-acceptance rates and higher voluntary turnover within the first year of employment. In Part Two of Engage2Excel’s 2017 Trendicators Talent Acquisition Report: What You Need to Know about Today’s Job Seekers, we examine the perceptions and preferences of job seekers from different demographic segments. The Importance of Understanding Demographic Differences: Common sense dictates that different demographic groups share perceptions, preferences and behaviors during the recruitment process. However, until now, there has been a lack of data for understanding these differences in today’s talent marketplace, or how to take action on them to improve results. As a result, many companies resort to homogenized recruitment strategies. 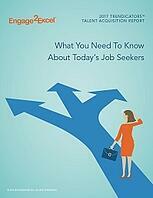 Employers of choice recognize that effective talent acquisition is marketing. Whether you are marketing products or employment opportunities, one-size-fits-all strategies don’t work. Just as consumers are drawn to brands that “understand them,” job seekers, who have many more choices available to them today, are attracted to employers that cater to their career requirements, interests and expectations.